H&R Block At Home Free Edition is an iOS tax preparation app designed for the iPad. 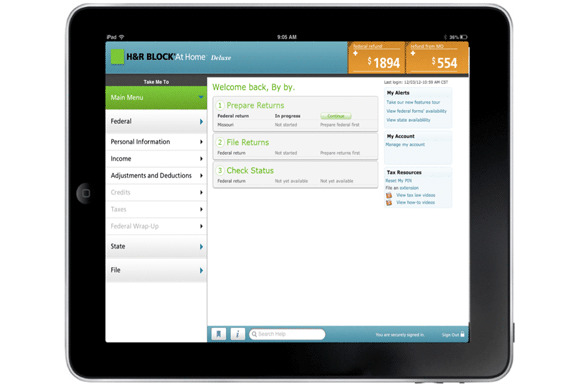 Like the H&R Block 1040EZ app, H&R Block At Home Free Edition makes it easy for you to file your tax return on your iOS device, but while the 1040EZ app is limited to basic returns, H&R Block At Home Free Edition can handle all your personal tax needs. One and Done: Quick and easy to use, you should be able to complete your return in a matter of minutes as long as you have all your tax paperwork handy. While “Free” is part of the app name, filing your tax return isn’t guaranteed to be free. Your state taxes will cost anywhere from $28 to $35 and some Federal tax filings may cost $20 to $50. As is typical of apps such as these, to get started yo have to go through a brief interview process before you enter any tax-related information. And here, as was the case with the 1040EZ app, is where you’re going to want to create an H&R Block account before you move ahead, as the app tends to “forget” the data you’ve entered if you get distracted for a few minutes. 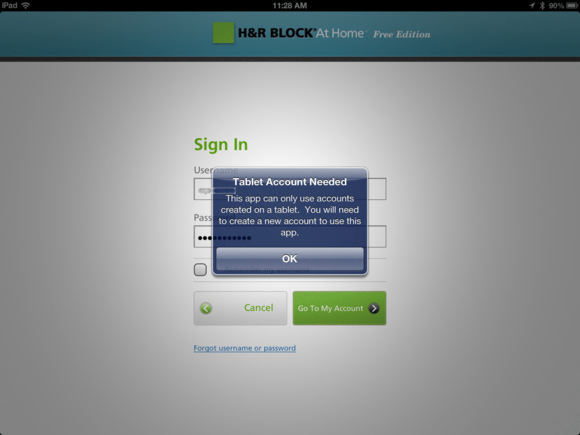 I was also frustrated by the fact that I couldn’t use my existing H&R Block account when working on the app as it requires an account created on a tablet device in order to work. Those frustrations aside, entering data in H&R Block At Home Free Edition was a snap and as long as you have all your paperwork you should be able to complete your return in less than 30 minutes. Using the app requires some awareness of your personal financial situation, particularly if you have a mortgage, kids in college, or interesting income information. But even if you’re not 100 percent sure of your needs, the app does a great job of guiding you through potential trouble spots and getting your return filed right. Not So Fast: H&R Block At Home Free Edition lets you save your data in the cloud, but won’t let you use an existing account you’ve created on the H&R Block site. 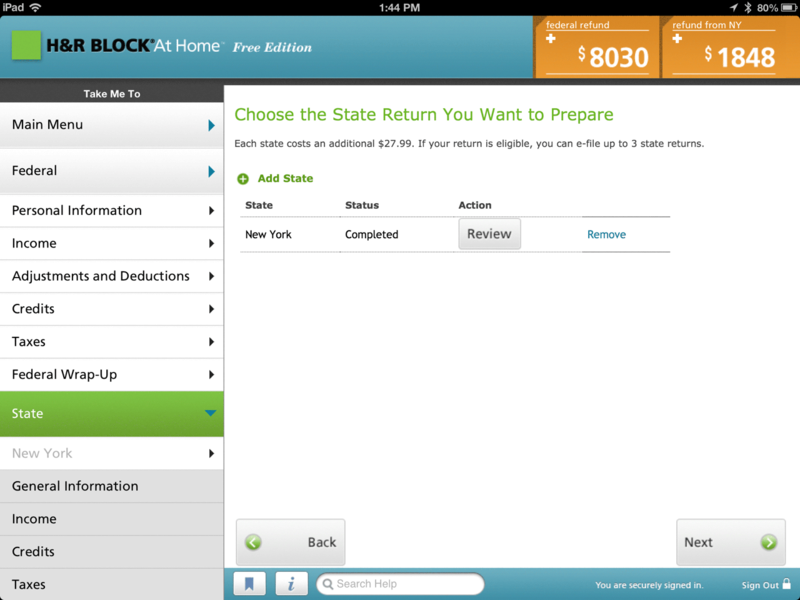 H&R Block At Home Free Edition makes quick work of filing your taxes accurately and on time. Minor account frustrations aside, it’s a great way for you to fill all your personal tax filing needs.